The Dale Boatman Library is a mainstay of the HAA Art Gallery/Art Room. 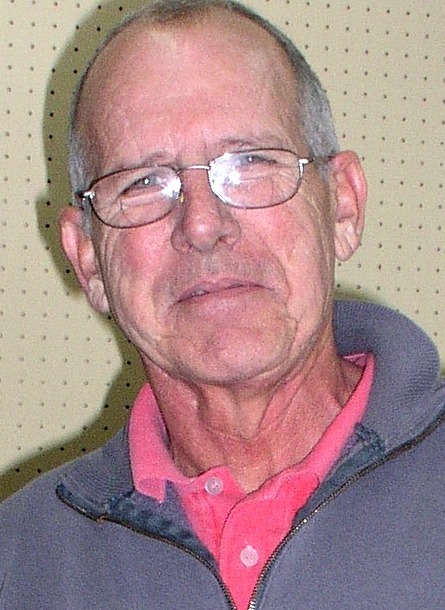 Dale Boatman was one of the founding members of the Association back in the sixties. He was employed on Fort Huachuca as a graphic artist and was a professional watercolor artist as well. He and a small group of artists gathered their love of art and wanted to share and teach various art media with other aspiring artists. 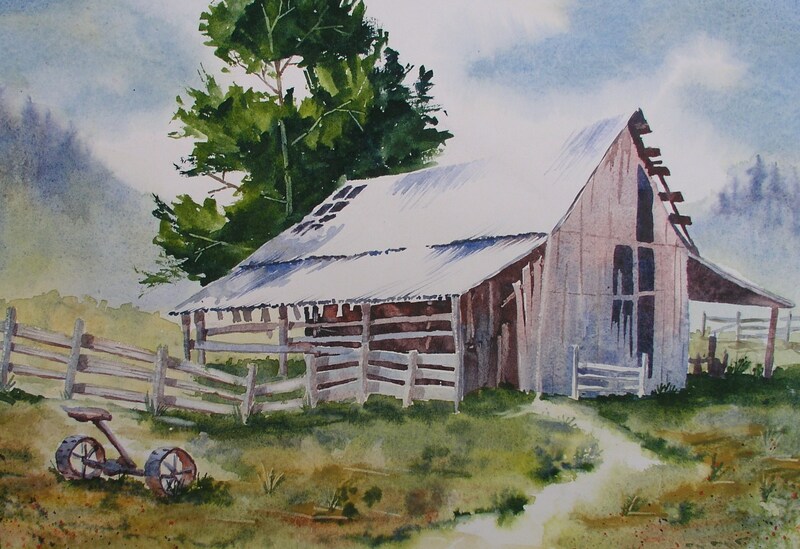 Dale taught extensively in this area of Arizona and his watercolor students are now nation wide. 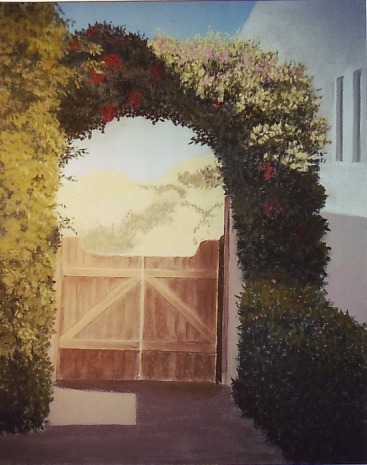 His students remember the extensive study materials he offered along with the research and study materials he supplied in each of his watercolor workshops. This vast collection of reference photos, lesson plans, and sample paintings are now housed in the HAA Art Gallery. Any member of the HAA has permission to check out his materials for their study and paint with his lessons. Recently a new member, Joe Hubbard, visited the Library and volunteered to collate the materials into a more user-friendly notebooks. Thanks Joe! Members are invited to spend some time thumbing through the collection and challenge themselves with a landscape painting lesson of Dale’s. Dale’s personal collection is just half of the Dale Boatman Library. The other half are the ART BOOKS! He was an avid collector of art history books, art teaching books on watercolor, oil, pastel, drawing media. All are available for members to check out for reading and practicing their art styles. One of the benefits of this library on art books is that they are timeless. They may have some older editions but in art we can learn from the old masters of art history and the teaching of media techniques are always timely. A members time spent visiting this library will be filled with possibilities for your own artistic journey. In today’s market, galleries are still closing and the competition to get into those galleries that remain is tougher. So, why bother trying to get into a gallery now? Exposure for one, and optimism for another! Art Resume: Even if you haven’t had a formal art education, you may have lots more to say about yourself than you think! This art resume, or biography, should be no more than one page with a header that includes your name, address, phone #, website and e-mail. If you can, include a thumbnail image of your art work, and/or an image of you next to one of your pieces. Next, list your art affiliations: First and foremost if you are presently, or have been, in art galleries, that’s the first thing you should list. kind of a Catch 22, ‘cause if you’re already in galleries it’s easier to get into more galleries. List your membership in art associations and art show awards—keep them current for the last five or so years. This shows that you’re serious about promoting your work. If your membership with HAA is it so far, list that, and any shows and awards you’ve received at these shows. List anything you’ve done to promote your art or anything you’ve done to share art with the community—teaching art to adults and/or children? List it. LEAVE OUT: the fact that you’ve been painting since you were ten, your cats, dogs, children, and how many times you’ve moved. Website: This can be simple or complicated, but websites are now easier than ever. That said, a professional looking website that’s easy to navigate will get you noticed. All artists should have them. Keep it current with new images and art awards and shows you’re entering this year. Do you have a customer e-mail list? Be sure to send them notification of upcoming shows and awards and remind them to look at these new pieces on your website. FACEBOOK: Easy, peasy—really! Connect with friends and family and people who’ve either purchased your art or have admired it. Put up an image and description of each new piece when completed and remind everyone that they can see more on your website. Business Cards: Again simple or complicated. I recommend one with an image of your art on one side and the contact information on the other. As for information, put your name, e-mail, website address and phone number on it. Mailing address is optional and up to you. 1) Single ownership: Sole owner operated by artist(s) with no acceptance of anyone but the owners. 2) Co-Op: LLC (Limited Liability Corporation) or a simple partnership in which the artists agree to rent a building and split the expenses. An example is Copper State Art Association is a co-op within another gallery: Tubac’s Rogoway Art Gallery. They have a nice set up in the back of this very reputable fine art gallery. The members jury in each new artist with a maximum of eight artists showing. There’s a monthly fee to each artist plus a small commission for sales. Rogoway does the sales and book work for them. Subway Gallery in Bisbee: limited number of artists. Monthly fee? Commission? Docent? Accept new artists? 3) Non-Profit Gallery: These are associated with membership in an art league and most of them have member shows in which members are required to docent for the shows. They are funded by grants, membership fees, fund raising, and in the case of HAA, Art in the Park. 4) Wall space galleries: Customers don’t usually know that this is anything other than a professional art gallery. It’s owned and operated by sole proprietorship or LLC. This type of gallery is growing in popularity because it gives the owners and artists a way to keep business rolling without the artists having to docent or do the business of gallery ownership. The artist pays for some space per month and then pays a smaller commission to the gallery for each sale. 5) For Profit: These galleries are owned by an individual, partnership, LLC and/or corporation. 40/50/60% commissions. Some galleries even purchase artists work and then resale it and it’s a way to mentor upcoming artists, though this method is on the decline since our latest recession. First to consider: Location. Close to home/in state is preferable to out of state. You should visit the gallery in person first to see if your work would be a fit for them. What kind of buyers do you think frequent this gallery? Arizona is seasonal and a typical tourist town (think Sedona or Scottsdale or Bisbee) will garner you the highest foot traffic. But with the short selling season, January through April, you might also want to consider a gallery with good potential for local sales. Well established and new galleries work hard to connect with locals who, with a card or e-mail, will come in and look at new art. Next: Is the gallery nicely laid out? Is the art well lit and reasonably displayed and inviting? You may or may not know exactly how long they’ve been in business, but it’s nice to know. But, don’t forget, a newly opened gallery might be to YOUR advantage. Either way, according to my poll of galleries in Arizona, owners are always looking for fresh and original art that SELLS! Take a closer look at the art; is it comparable to yours in quality and/or style? Western/modern/abstract/only watercolors or only sculpture? Be sure to look at the frames, too. If you’ve been hand-making your frames to save money, or because you have unique art that calls for this kind of frame, consider asking the gallery to look at the frames. You may have a wonderful story about these frames, and their unique style and story may make the sale. Then again, maybe not. Most galleries will have a say about framing and that could mean additional expense to you, so it’ll need to be considered in your decision. Let’s say this is your dream gallery, the art here is comparable to yours in quality and style and you like the feel of the place. If you really like the personal approach to gallery owners, consider visiting on a weekday. If, however, you work weekdays, and you just want to see inside this dream gallery, it’s not a good idea not to approach the owner or manager and expect to strike up a conversation about YOU. Even if there is no one else in the gallery at the moment, please don’t do it. Either pick up a business card or ask for one, but this—and here’s a secret you may or may not know–that card you just pick up is a sales signal and will get the immediate attention of any business owner. The owner is going to ask if they can answer any questions—like, “Which piece of art would you interested in buying?” Okay, maybe not that boldly put, but that’s the hopeful end result, right? Hold up the business card you just picked up off her desk and say, “I don’t want to intrude on your busy day, but is your artist submittal information on this card?” Let’s break it down: the first part of the sentence shows that you’re aware of how busy gallery owners are, even though you both can plainly see that there are no customers in the gallery. The next part explains why you picked up the card—you’re an artist and you’re interested in being part of this gallery. In your fantasy world, the owner puts down her paper work, offers you a seat and genuinely appears to be interested in mentoring your budding artistic career—or not. There’s payroll, sales taxes, artists’ commissions, advertising to review and a pile of invitations to an upcoming show and reception to be addressed stamped and mailed, all to be done by closing today! Eeeek! But, let’s go back to this hypothetical ideal gallery owner: She asks if you have your portfolio with you. Yes! You brought it with you and it has a biography and clear images of your work in it and she likes what she sees so you agree on a time to bring in your art to show her! Now, before you draw another breath, please remember the following: DO NOT ask the owner what they pay in commissions. If you’re invited into the gallery, the owner will discuss commissions with the contract. Now, let’s get realistic. Most owners, finding that you’re not a potential customer, may suddenly appear rushed or busy and you may feel you’ve just gotten the grand pooba of bum-rushes and your feelings are hurt. Don’t take it personally! Remember, timing is everything: If you’ve come in on a weekend, you’re taking her time away from potential customers. If you’ve come in on a weekday, she may have all that book-keeping, sales taxes to finish, customer invitations to send, or she’s just having a day from hell! It’s not personal, she’s got more to do than you can image! Just tuck the card into your pocket, lay yours on her desk and, with a quick smile, leave. And since your cover has been blown, this is not the time to hover while the gallery owner is talking to customers. Leave! Vamoose, sceddadle! This is their territory and your continued presence makes them nervous—“Uh-oh, why is this artist lurking while I talk to these customers? Is she going to follow my customers out the door, open her trench coat and offer them some really good art for half the price?” Sounds ridiculous doesn’t it? But, it’s been done before, so please remember, your future relationship with this gallery may depend on that first impression for both of you. Okay, so back to your fantasy world. You’ve left and she realizes you may be right for her gallery so she goes to your website and looks at all your images. It could happen that way, and sometimes does, but don’t count on it and certainly don’t wait for it. You’ve made the initial contact, she knows what you look like, you’ve got a card with a name on it, you like the gallery, the owner was pleasant and smiling, and she indicated that she would be willing to accept new art. If you will follow it up in a TIMELY fashion, you now have the chance to be considered. So what’s the next step? The card has a website? Go to it and see if there is an ARTIST CONTACT BUTTON. (some galleries even put a PDF contract on their website). Follow the directions for submittals. Read it carefully, print it out, read it again, and follow the directions. This is very important to do and here’s why: unless you’re the next Picasso, if you ignore or can’t follow the gallery owner’s directions, it’s a signal to her that you’re inexperienced and unprofessional and may be too much trouble to deal with! And we all know that’s just not true, not with you, anyway. Okay, let’s say the card has no website, only an e-mail and phone number. E-mail the owner, put “artist submission” in the subject line and address her by her name, reminding her that you were in her lovely gallery last week (give the day, time) insert your one page brief artist biography into the message (not as an attachment). Attach a couple of images or put them at the bottom of your message. Don’t forget to label them w/title and size of image and be sure to crop out the frame. I prefer the body of message as attachments can be overlooked. If she doesn’t respond in a couple of days, call and ask if she got it, or you need to resend. Or is there another way she’d like to see your work? Maybe she has an artist submittal day when she’ll invite you to come into the gallery. Let’s say she gave you a day and time to call her so you could talk, or you didn’t pick up a card, or you haven’t been to the gallery, but you saw it in a magazine, or a friend says this is a place you should consider, but you haven’t had the time to go visit. Call the gallery on a WEEKDAY. Oh, no, that’s scary! What do I say? Regardless of the exact words, you can write up your own, but do write it until your satisfied that you don’t stumble around your words. You want to get the name of the contact who makes these decisions and the time and date when you should call back. THEN DO IT! Don’t be afraid, what’s the worst they can say, “No”? Hahaha! You laugh at ‘no’!! You’re an artist whose work will one day delight millions! Okay, maybe not millions, but at least someone besides your aunt Ruthy. If you’ve been told to mail in your bio and images of your work: Be sure to label each image with image size of work/your name/medium. Do not include the frame in the image. Crop it or do it without frame. Try to get the best image possible—daylight with indirect light is best. Label the CD and put it in an envelope or jewel case. IF you want the CD returned enclose an SASE. Be sure to let them know that you will accept their decision via e-mail—it’s the least personal, but if the answer is a NO, at least they don’t have to hear you sobbing on the phone! Give it a reasonable amount of time, if you don’t hear from them, call and ask about it. Be pleasant, be courteous. I’ve accepted artists at a later date simply because, all other things being equal, I liked them! 1) We used to have a five page contract—all meant to keep down the potential for misunderstanding—not always successful, but we tried. 2) Got questions of the contract—ask. Don’t agree with something? Ask to change it. What can they say, no? 3) How long is the contract for? 4) If it’s wall space we did a three month minimum required, paid in advance. 5) Many galleries go month to month. 3) this is where the big boys play—the $100K paintings! IF you have not sold anything within the first three months, call or e-mail or visit (during the week) and ask the following: If no sales yet, has there been any interest in my art? What are the comments. Does the gallery want bigger/smaller pieces? Price cuts—just remember you can allow the gallery a little “wiggle room for those customers who love your art but are “wobblers” and a 10% discount might make the difference between walking out the door with your art or leaving it and not coming back. We required that our artists allowed us some discounting5-10% and sometimes it would be the sales tax 8.6% in Bisbee! Or we’d ship for free. The artist and gallery can split the cost of the shipping, or the artist can agree to allow the discount in the amount of the shipping to equal a 10% discount. Sales can be seasonal or timing: some galleries like to keep favored artists for years/others will want to change our artists to try someone who works better. The whole point of a gallery is to sell YOUR art. IF there has been no interest in your art—try not to take it personally! I’ve known many very fine artists whose work I’ve adored, but they don’t sell at our gallery and we’ve had to part company. Why? I’m not sure if there is an answer to that, except to say that they are better off in another gallery—and sometimes it’s in the same town and down the street!! 4) All galleries should state in writing when you can expect to receive your check. We paid on or about the 15th of each month following the sale. We stated that if you don’t get your check by the 28th of that month, please call us. Over the years we were in business, we lost two checks in the mail. Sold something? Ask if you can bring in new art for approval. Most gallery owners will want the option of chosing what they think will sell. And then some galleries will take all you’ve got. But, always ask for permission and a good time to come with new art. We’re up – updated, uploaded, uptown, online, on time and on target. Welcome to the Huachuca Art Association’s spot on the super highway. Come, explore and then come for a visit to our hide-a-way gallery just a bit south of Sierra Vista, Arizona. 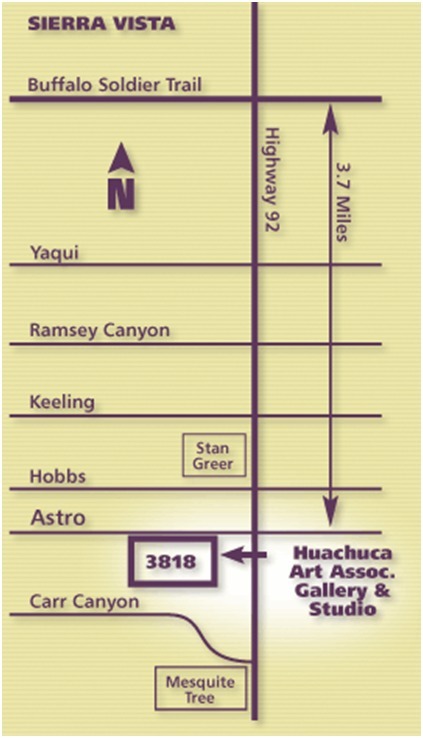 Gallery & Studio Location: The HAA Gallery & Studio is located at 3818 Astro Street in Hereford. Astro St. is off Hwy. 92 — less than four miles south of Buffalo Soldier Trail (Sierra Vista). Driving Directions: From Sierra Vista, head south on Highway 92. After passing through the traffic light at Yaqui, watch for Ramsey Road/Ramsey Canyon Road. Astro Street is the third street after that, on your right. (Astro Street is 3.7 miles south of Buffalo Soldier Trail.) Turn right onto Astro Street. About a half a block on your left, you will see a group of buildings, the Gallery is right there. Big sign. Gallery & Studio Hours: The HAA Gallery & Studio is open every day from Noon to 4 PM. During those days/hours the Gallery phone – 520 803-1078 – will be answered by the docent on duty. To visit outside these hours contact Gallery Director, Sherry Harig , 775 304-5684. The Gallery Features: Monthly art exhibitions open to the public. Free. Members create both two and three dimensional art. Each show opens with a monthly Artists’ Reception, usually on the first Saturday of the month. Watch the local papers for additional information or call one of the officers listed below. The Studio is the site of workshops and classes: Free non-instructional drawing and painting sessions are held weekly for members. Workshops are scheduled regularly and cover many media. Private lessons are also available from HAA members. Contact: —. Membership Meetings: are held the third Saturday of the month (except July and August) from 10:00 – 12 Noon. There is an art demonstration or related presentation of interest to artists. Visitors welcome! Free. Contact Edie Manion 520 803-1262. Membership Form: Join us and enjoy the camaraderie and benefits of being a member of the HAA. Click here to go to the membership application – print it out, fill in the blanks and return it to the Association.